Didn't make it to Fountain Hills. Instead, we ate breakfast at "Matt's Big Breakfast" in downtown Phoenix. 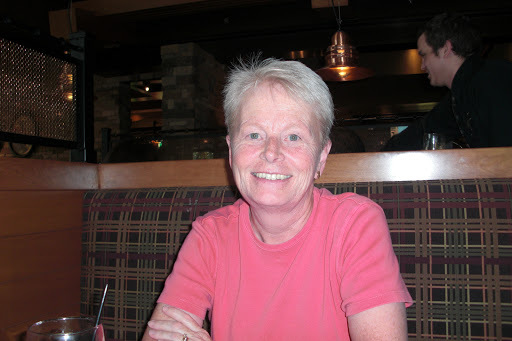 Connie V has several diners on her list - this was one of them. A very small building - had to wait outside for a table. Breakfast was very good; thick bacon. By the time we left, the outside crowd had grown considerably. After "Matt's" we stopped at Fry's Electronics; from there to the Ahwatukee Farmer's market. We planned to get some relishes from "Terre Verde Farms", but they were a no-show. Bummer. Their Spicey O's are VERY good. We did get tomatoes and olive oil. Then on to Ikea to buy furniture for Donna's work, and to Chandler to try some wine at Kokopelli's first annual zydeco festival. Problem - the festival ended on Saturday. A misprint in the paper! Lastly, we visited Queen Creek Olive Mill - brought home a jar of Wasabi-Ginger olives. They are very good in gin. We returned back home early afternoon after a short detour via Florence (we didn't believe Keith's GPS and took the REALLY long way home)! For our next trip, Donna and I are taking LaMarr to the Steel Pan Band at ASU. Our group is still small - not much discussion on Ubuntu. We've changed the agenda to cover all computer concerns and hope attendance will increase. I think we're going to the Fountain Hills Arts Festival on Sunday. They expect about 500 artists and over 200,000 people during the three day event. Should be some very interesting art - hope we can keep our expenditures very low. I'll take some pictures. Anne says she has not had a night of screaming in at least two years!! Please send her your suggestions. Took a road trip to Giant Hamburgers. Online reviews said this was a great place for breakfast. So-so. Still like breakfasts at Cracker Barrel. I've added a few photos I took a couple of weeks ago upon leaving the Park. A beautiful sunrise was presented about the time we passed through the area of the 2006 forest fire. You had to be there - the pictures aren't enough. Ubuntu is installed and working on my older laptop. It boots very quickly and shuts down even faster. It doesn't have all the pretty stuff that Vista has, but it has promise. All of it is free!! Once I get home, I will try to use it most of the time. Only 11 working days to go. About the only visitors now are tours; last night was very slow - no customers in the store at closing time. It's now official - the Shop will stay open until December 1. There should be lots of snow by then and no customers. How will the staff stay busy??? This Winter I'm trying Alltel's EVDO, Rev. A internet access as a replacement for the park's DSL. It provides speeds up to 3Mbps (althouth 1.2 to 1.6 might be typical) and it's cellular based. This means my computer has a small card in the pc express slot. I'll also use a router at home so that all devices can access the network. This card has an external antenna capability that should provide excellant signal strength. I've been given 30 days to try it out. Last night it worked well in Gold Canyon - doesn't work here at the Grand Canyon (I have no external antenna). It was nice to visit "the big house" again. I discovered why our electric bill was so low this last month - the air conditioner was turned off. Don't know how that happened; maybe I did it in July when we last visited the house. Anyway, it was 95 degrees inside when we arrived. A couple of candles had melted a little; otherwise, things seemed ok.
We spent some time at the Alltel office. Turns out our phone has a reception problem (the reason for all the dropped calls) and a replacement phone is being shipped to us at the North Rim. I also signed up for Alltel's internet service, rather than continue with the DSL in the park. I'll use Kyocera's small card and will be able to access the network in most locations in the country. Initial tests indicate the speed at almost twice that of the park's DSL. I already have a Kyocera router that will use the card at home. We cleaned the deck; not sure we removed much dirt, but the carpet "looked" cleaner. And, we brought back a lot of stuff we won't have to try to pack in a couple of weeks. It was great to see some HD television again. Man, are we anxious to get home! So much so, that this next Monday & Tuesday we're driving down to deep clean the deck. Donna will schedule an eye doctor visit, and Steve will try to help Connie with some computer problems. I know it's a long trip, but some days away from Junior are always nice. Consider it a mini-vacation. I've used Chrome for a while now; I like the apparent speed and the minimalistic style. However, I find myself always returning to Firefox as the browser of choice. I guess I have too many added features to Firefox that I enjoy. I'll try Chrome again once they've added additional features. But, who is counting? Me! Nights are getting a little cooler - it was 50F this morning. I'm hoping we can leave before the first significant snowfall. More Aspens are turning yellow in their top branches. And work is slow. I think we had a couple of bus tours yesterday (and they spent the night), so activity in the Store was a little higher. Today's our "thursday", so the weekend is near. I think we'll go to Kanab and have my blood viscosity checked; and, get some groceries. Donna is making dinner. Picking our pills for the next week is next. Must go. The last few days at work have been very slow. After school started, the attendence seemed to drop off quite a bit. We are getting some tour buses, but not many so far. I think I've hit a wall - I want to return home and work on the "big house". A change of scenery, I guess. We only have five weeks, and I suppose it will go fairly quickly. I think we both agree that about 4 months in Junior is max. We go to St. George this Monday for an overnight trip. We seem to take more of these trips this year - it's nice to have a "vacation" with a big bed. And, eat out. There's a new internet browser out there - Google Chrome. It's very fast and with very few settings. A little different interface - try it out. I think I like it. Guess that trip to LV was too much for me. I really deteriorated Friday, and the trip back home on Saturday was VERY LONG. I tried to give her a nice experience, but the germs didn't cooporate. I'll try again next year. In two days Donna turns 58! We've been planning a trip to Las Vegas to celebrate her birthday, but she was sick a week a go, and this week I caught her bug. Although I'm still puny, we forged ahead and came to the bright lights of sin city. We arrived yesterday afternoon and spent a few hours in an outlet mall near our hotel. The goal was for Donna to get some replacement shirts for her aging wardrobe. She found nothing! Today we visited a couple more shopping areas and she did find one shirt!! I started to poop out, so we are now back at the hotel, reading books. When you get to a certain age, birthdays are not as exciting as they used to be. We tried. Here's a picture of Donna at the Claimjumper (Las Vegas) in the Town Square Shopping Center. 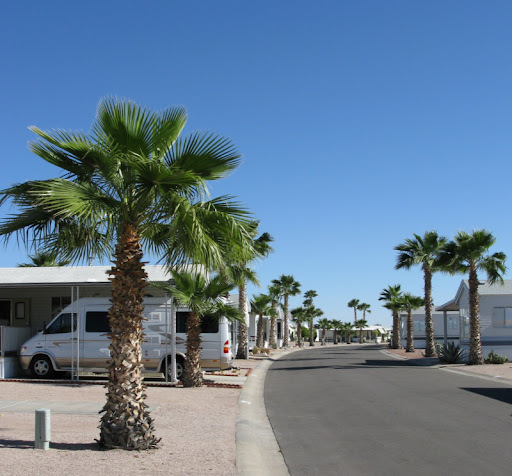 Is an RV Search Next? An interesting thing happened today at work. Next week there will be an inspection of the property to support acceptance of Forever Resorts into an ISO and OHSAS compliance program. This is something that Forever wants and would be a significant step in showing the world that Forever is dedicated to the safety of the employee and the protection of the environment. The interesting (and disturbing) thing is that our lockers at work (I know - it's Forever property) were searched without our knowledge and we were told we could not have hand cream or sanitizer solution within. So, we had to remove those products and take them home. We sell hand cream at the store. Do you think it would be ok to have that cream in our lockers???? Apparently not. This bothers me. Will they search our rv next? Looks like we're staying on the job until October 10. Donna has accepted a Lead position and has promised to work until then. It's a little later than we had planned - maybe the snow will wait! Today was a day off for us. We had our normal breakfast at Jacob's Lake Inn - very good. 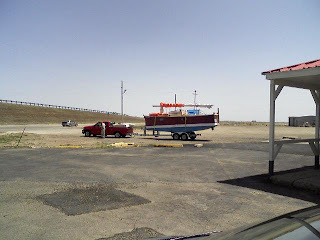 Then it was on to Kanab for groceries. On the way back we encountered some heavy rain showers (normal for this time of the year). It began to look like viewing the Canyon might be interesting. So, a short detour to Cape Royal gave us some of the most colorful views yet. Take a look at the latest on our SmugMug site. It's a very interesting concept - read a book, then release it to the wild. Record the information on it's release and then track it's journey. Kind of like - "Where's George" for the dollar bill. I've set up an account and have registered all the books we have yet to read - quite a pile! Our user name is "sshaff" if you'd like to take a look. We hiked to Widforss Point today - 10 miles round trip. This is the longest hike for us in many years. Lot's of sore muscles! Widforss Point is at the end of a trail just West of our location at the North Rim. It affords more expansive views of the Canyon. I took a few pictures, but the overcast did not allow any good shots. Take a look at them on SmugMug. Yes, we just measured 50.8 mpg in Doodle! From the North Rim to Verde Valley (I know, all down hill, but we were loaded with stuff) we have obtained the best mileage yet. I think it's because I added 3 psi to each tire - thereby decreasing the rolling resistance. I'm pretty excited. Mileage from Verde Valley to home (and some travel around town - I'd forgotten how bad the traffic is) and then back to Verde Valley was only 40 mpg. Still pretty good. 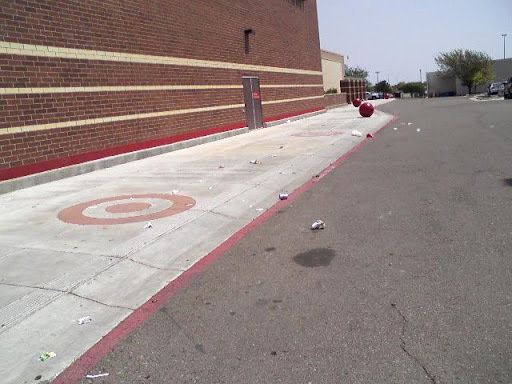 It's halfway through the season and we need to clean up a little. So, during our next days off (Friday & Saturday) we're going home. Taking back a lot of things we haven't used and will pick up a change of wardrobe, my better camera, some computer software, etc. It'll be a long trip, but a good change of pace???!!! The car is now packed and it's full! One of my favorite movies is "What the bleep do we know?". It suggests that our collective mind is a very powerful force, and that everything in the universe is connected. Consequently, I receive email from an associated organization. This organization has performed experiments that indicate groups of people who focus on solving some problem, do have an effect on that problem. To this end they are trying a much larger experiment. You can read about it here - http://www.theintentionexperiment.com. Sold the Acer 2GB with Vista a few days ago. That helps the cost of the new computer a little bit. Still have an XP HP that I might sell when we return to the valley. Don't know yet. I've always wanted to spend time with Linux (Ubuntu), so may install that first and then reinstall XP to sell machine. Let me know if anyone has any interest in either. I didn't get those expensive shoes (mine cost about $100), but I did get some that have a 30 day return policy. That should give me enough time to see if they're comfortable. They seemed good in the store - time will tell. I'm also trying some new socks - Therlo. Last weekend we stayed in the Park - didn't want to get out in the holiday traffic. We are now depleted of many food and supplies, so need a city fix again. It's amazing how little we can store in the RV - even with the extra power cooler (that's mostly used for wine!). Anyway, we leave tomorrow for another weekend outing. I'm not ready to spend the whole day driving to and from, so we've reserved a room at the Fairfield Inn. We will visit a specialty shoe store in hopes of finding something that makes standing for 9 hours a day a pleasure! Our neighbors have ordered some sort of weird shoe that eliminates their knee and back pains, so we want to see them for ourselves. They are a little pricey at $270!! The computer arrived about a week ago - much earlier than promised. It is very small and with the screen folded over it can be easily held on the lap or in the hand. Still a little heavy. The battery sticks out the back about an inch - something I hadn't realized from the descriptions. It should be very easy to transport and, hopefully, last several years. Just read a couple of books recommended by a guest (she knew I liked Science Fiction). "Jumper" by Steven Gould and "Ender's Game" by Orson Scott Card. Very enjoyable. I'll be reading the sequels to Ender's Game, plus the rest of Card's efforts. Gould has a sequel to Jumper, called "Reflex". That'll be on my list, too. Yesterday was our weekly trip to civilization (aka shopping). This week was to Page with stops at Antelope Canyon and Horseshoe Bend. Both were very beautiful. Photos can be seen at either SmugMug or Picasa Web. We had made Antelope Canyon tour reservations with a company called Antelope Canyon Tours, but upon arrival in Page, we soon discovered our mistake. This company's philosophy is to cram as many tourists through the canyon as possible. Although the canyon was quite beautiful, it was very busy. Lot's of tours and tripods! 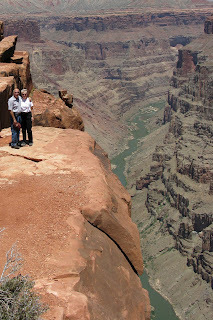 We later learned that a couple of smaller tour operators provided a much more intimate inspection of the canyons (Overland Canyon Tours appeared to be one of the small operators - www.overlandcanyontours.com). Also, there is an opportunity to be on your own in the Lower Antelope. We'll try the Lower Canyon next time - take a look at this photo (http://en.wikipedia.org/wiki/Image:Lower_Antelope_Canyon_entrance_01.jpg). It has been very chilly here the last few days, but it seem like it might get close to 70 today. We bought a few essentials (foam mattress cover, some stick on lights for reading, and wine) during our last trip to St. George. We may try Page for our next day off and combine that trip with a small hike to a Colorado River overlook. Our electric space heater failed yesterday morning, so I'm getting a replacement shipped in from Amazon. We'll see what that service is like. Even though the weather has been cold, the crowds are large. CJ and Woody are here, and providing entertainment in the evenings for the dinner crowd. Wow! Cold here today! It snowed most of the afternoon (it didn't stick), and was below freezing when we got off work. The water hose to the RV was frozen - glad we had a little water in the tank. It's supposed to be below 25 tonight. Brrrrrr! Chance of rain and snow for the next three days. I'll bet Phoenix is great right now! Many, many guests have been caught without the proper clothing. Too bad the Gift Shop didn't have more sweatshirts and pants. The canyon was cloud-enshrouded most of the day, but the photo opportunities when the sun shone through were quite spectacular. Wish I had the time off with a camera. Tomorrow we travel to St. George for a shopping trip. And, some meals out! Hey, it may snow on our next day's off - Friday and Saturday. What timing! Yesterday was a very busy day in the store - kind of like opening day. Yesterday was opening day at the Store - very busy. Much busier than I expected - folk must have been lined up at the gate. Everyone very impressed with the store and it went rather smoothly for an opening day. Today was the first of two days off and we went to Kanab and a couple of overlooks near here. Picasa web has some of these new photos from Point Imperial and Cape Royal. Also found a clinic in Kanab that will perform my monthly coumadin check. We bought groceries and ate dinner at Nedra's (a pretty good little Mexican restaurant). Tomorrow, Donna irons (we tried the campground laundry this evening) and cuts my hair. This sure is a nice area - too bad Buddy and Suzi aren't here. Whew! That's a long day's drive to St. George. We did laundry, and purchased groceries and other items. Donna found some new hiking shoes - the last shoes she bought caused her problems shortly after she tried walking up and down hills. Maybe these shoes will work better - they're Vasques. Kind of slow driving after we turned south into the park from Jacob Lake - deer everywhere. It's amazing those little suckers are almost invisible until your right on them. We've been at the North Rim for about a week. The Gift Store is coming together, and it's going to be one of the best looking we've worked. Forever Resorts believes in quality, and it shows! We have tomorrow off and will be spending the day going to and from St. George. Seems we forgot a few necessary items for the summer. I'll post a few Grand Canyon photos on SmugMug. We left Gold Canyon at 9am this morning. After 200 miles into a strong headwind, we've stopped at J&H Campground in Flagstaff. 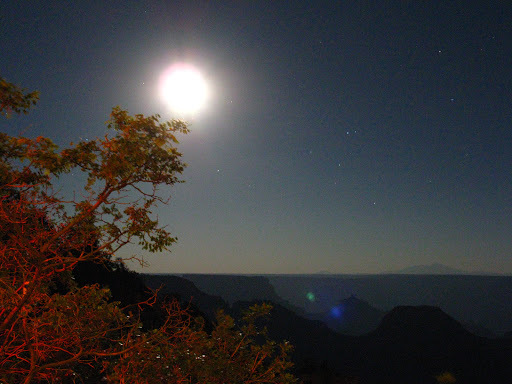 Temperatures are expected to get down to 25 tonight - a good test our first few weeks at the North Rim. 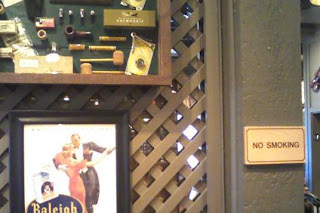 Smoking display in the non-smoking section of a Cracker Barrel. A recent hail storm in Ft. Smith, Arkansas caused a considerable amount of damage. 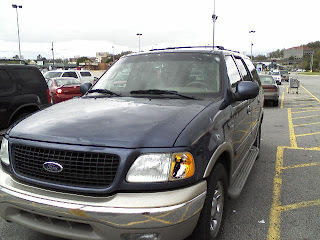 This a car at K-Mart that had a little more damage than most. 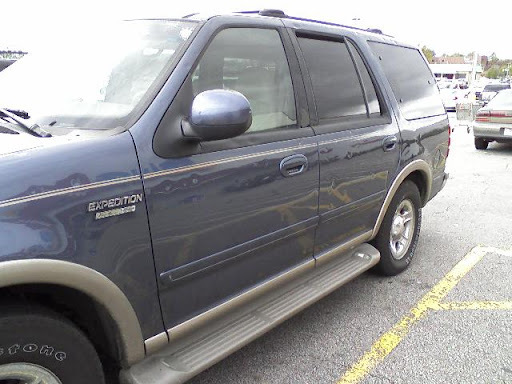 Note the broken windshield. And finally, this "boat" was the summer home of these Canadians from Alberta. They had spent the summer in Galveston. It looked home-made, and I'm sure it had more room than our small RV. Interesting. We arrived home about 2 hours ago. It's nice to not be driving right now. This trip included 7 days in the car! Out of a 14 day visit. We might look into airfare for the next one back to family. BTW, we got our best gas mileage yet - Holbrook to Apache Junction - 48.7 mpg!!! The hotel has HD tv, the first we've seen in a hotel. We've stayed at one that had the HD tv set, but the service was SD. This is HD service! No wonder we're paying top dollar for this room. After a long drive from Ok City, we've arrived at the Marriott in Albuquerque. We're staying at the one on Louisiana and I-40. A very nice room. They've put us on the concierge floor with a free breakfast. The only drawback is having to pay extra for internet service. We ate in a new shopping area across Louisiana. We had a salad and fried fish at the Elephant Bar. It was very good. And, it appears to be a popular place. We have one only about 25 miles from us in Chandler; we'll have to try it sometime. Back to Gold Canyon tomorrow. We're now visiting Donna's parents. Yesterday we ate at Steak n Shake - we do this twice a year. Great onions! George's hamburgers are better. Just had lunch at "George's Restaurant" in Ft. Smith Arkansas (2120 Grand Ave). Very popular, very good, and inexpensive. Excellent hamburgers and lot's of fries. Give it a try! Took a picture today with the cell phone, but now can't download to pc to put on site!!! I have bluetooth connection with pc, but can't see files on phone. I didn't bring the usb cable because I thought I wouldn't need it. After having dug to a depth of 10 yards last year, New York scientists found traces of copper wire dating back 100 years and came to the conclusion that their New York ancestors already had a telephone network more than 100 years ago. Not to be outdone by New Yorkers--in the weeks that followed, California scientists dug to a depth of 20 yards, and shortly after headlines in the LA Times newspaper read: "California archaeologists have found traces of 200 year-old copper wire and have concluded that their ancestors already had an advanced high-tech communications network a hundred years earlier than the New Yorkers." It's very quiet on our street. Got in at the doctor's right on time! This is gonna be a great day! Another happy hour tonight; we've just about cleaned out the cupboard. Doctor appointment tomorrow 7am! Whew! And, even then they won't be ready to take me - seems you must wait a while, no matter what your appointment time. Another little party on Saturday and then it's an early departure on Sunday. Hope the midwestern storms are gone by then. I'm trying ScribeFire to add a blog directly from Firefox. So, this is only a test, had this been an actual emergency, you would have been told .. I was trying to do some things with the previous site (it used Tumblr) and found that the program wasn't getting much support anymore. Also, I couldn't find much out about the technical aspect of the service. So...... I've switched to Google's Product - Blogger. We'll see how this goes. Take a look at some the more recent blogs at the old site (link is on the left side of this page). I'm starting to look for Grand Canyon photos, and the one at Toroweap is pretty tense.